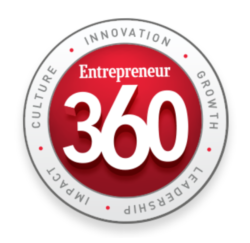 Well Rounded, Customer-Focused, and Driven… These are a few of the traits that were necessary to qualify for this year’s Entrepreneur.com’s TOP 360. A collection of not only some the country’s fastest growing companies, but also some of the most sound. Entrepreneur.com’s TOP 360 recognizes that growth is only part of the formula for a lasting firm. Company culture, values, and profitability are the sustaining factors that make a well rounded business. 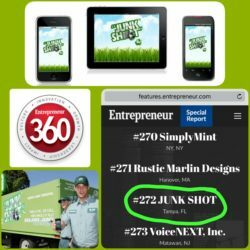 So join us in celebrating JUNK SHOT APP – Junk Removal’s addition to this year’s Entrepreneur.com’s TOP 360. We’re delighted that our Team’s hardwork and customer dedication has not gone unnoticed. And as a national leader and innovator in Junk Removal services, JUNK SHOT App is proud to be listed as a TOP 360! To View JUNK SHOT App and the other Entrepreneur.com’s TOP 360 recipients, CLICK HERE! Founded in 2010, Accelerated Waste Solutions is a Tech-Waste Firm, pioneering the USA’s 1st and Only, patent-pending Junk Removal App, “JUNK SHOT!”. This proprietary app allows smartphone users to capture and send photos/video of their unwanted junk/trash for a Fast, Free Quote & Pickup Time. AWS is also a national leader in 5-Night-A-Week, Apartment Doorstep Trash & Recycling Collection, developing innovative technologies like, “DOORSTEP DETAILS” Trash Collection Reporting systems. AWS/JUNK SHOT operates services reliably in 11 States for over 11,000 Residents every single day! © 2019 Copyright Accelerated Waste. Web Design | Visual Realm.